Ideas for a new business might be right under your nose...the key is to act on it as soon as you see the opportunity come available. Sometimes you don't have to go very far to find ideas for a new business. It all began in a food co-op rummaging through the granola bins. The co-op sold a commercial granola blend that was pretty popular, but I just wasn't happy with it. In addition to the flavor, the price was also steep to me considering the simple ingredients and even at low co-op pricing. I decided to try making my own, having no idea how to do this and having only the ingredient card to go by. I knew it would need to be toasted, but the exact method was a mystery. I did locate a couple of recipes but was not happy with the ingredients which included a lot of oil, usually canola oil. I had nothing against the oil except the quantity and the lack of flavor. I purchased bulk oats, wheat, and rye flakes for the base. These were very cheap materials to use in food experiments, fortunately. For sweetening, I used maple syrup, also bought in bulk, as well as honey and brown sugar. 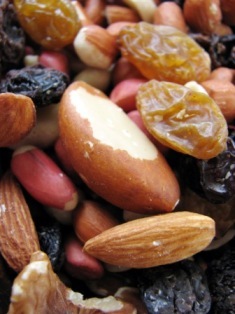 Dried fruits and raisins and nuts were also available for the mixtures. I used real butter for the fat, but reduced the quantity greatly for a lower fat granola that had tons of taste appeal. I learned the hard way that you can't add the fruit and nuts to the mixture from the beginning, since the fruits will dry out to much and nuts may over roast. As I got the timing down I found the best time to add each one. I made different combinations like a honey brown sugar blend made with pecans and dates and a maple cinnamon blend with hazelnuts and apricots. We ate a lot of granola, some excellent and some that was tasted and fed to the birds. And here's the amazing part of all of this - my business grew pretty much by chance. I would have never come up such an idea for a new business...it just happened that way. All of the experimenting described above was all done in the beginning just for our own use. Ideas for a new business have a way of springing up on you when you least expect it. One morning a friend who was also a co-op member came by around breakfast time and was offered some of our granola. He was wild about the taste and begged to have a batch made for him. Of course, I customized the flavors, fruits, and nuts to his preference. Next co-op day he got his batch and shared some of it with other participants because he was so enthusiastic. Immediately, others wanted to order some, and the idea of getting exactly the flavors you wanted was hugely popular. These people shared their batches as well and for the next week I had a slew of orders. We quoted a price based roughly on cost and filled about half a dozen orders that first week. We had set pricing that also allowed for fuel costs and our time after the first week, in fact setting them a little higher since we had no real thought of a business at first. It helped that we happened to have a huge kitchen with two stoves and ovens, one gas and one electric and also had plenty of big roasting pans for the orders. Ideas for a new business might be right under you nose - the key is to notice an opportunity when it comes available. What started as just dissatisfaction with a commercial granola became a thriving small business in no time. People loved the customizing and we even created other innovations such as granola and powdered milk in individual zipper bags that needed only water for a quick meal. Backpackers bought that version in big bunches. So did some moms who wanted to simplify breakfasts. The greatest challenge was in knowing how many orders we could handle in what was still a small operation. Fortunately we learned this before getting over our heads, but word of mouth referrals eventually began to overgrow our capacity. Since I had taken a full time job during this time, it became too much and I had to phase out the business. I sold "granola lessons" on my way out and taught former customers how to make their own, though! If I had it to do over, I would have gotten a commercial shop and expanded the business to include bulk sales of standard recipes. Granola is still very popular and I suspect a custom gourmet business would be successful. It might be just the idea for a new business that you are looking for. Here's to your success in stumbling upon ideas for a new business that will make you - and your customer base - go absolutely wild!